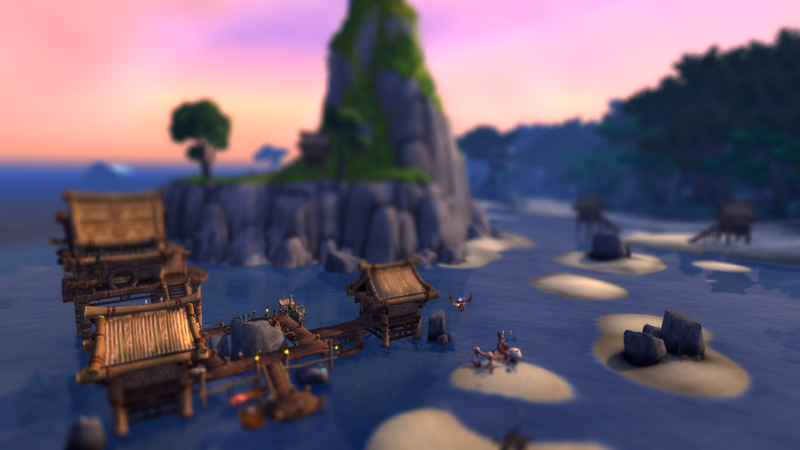 There have been a couple of cool tilt-shift shots submitted to Wow Insider lately (See the first two Related Articles below). I really liked them. You see a similar effect in the beginning credits of the Sherlock television show from the BBC. Anyway I wondered how to do the same thing with my own screen shots. I found THIS tutorial online and lo and behold, it’s not very difficult at all. All you need is Photoshop or any other graphics program that has masking and blur filters. Now, these aren’t REAL tilt-shift photographs. For those you need a real camera with a tilt-shift lens mount. These are digital approximations of the real deal. The following are my first attempts at tilt-shift screen shots. The look of miniatures is difficult to see in the thumbnails so click the image to get a larger view. These shots are from the beta around the Valley of Eternal Blossoms. Not too bad for a first attempt. I’m using an OLD copy of Photoshop CS (2003-ish). I’m told that Photoshop CS6 has a really cool tilt-shift filter that you can apply. But I’m not dishing out that kind of money just to get that. I’ll practice with CS and see if I can get better at this. That’s really awesome! I’ll have to try this.